Our story. We love to sing! During the summer of 2013, a group of men gathered around the idea of creating a new all male choral ensemble dedicated to providing quality musical entertainment while educating its singers and furthering a positive image and appreciation of the LGBTQ community. 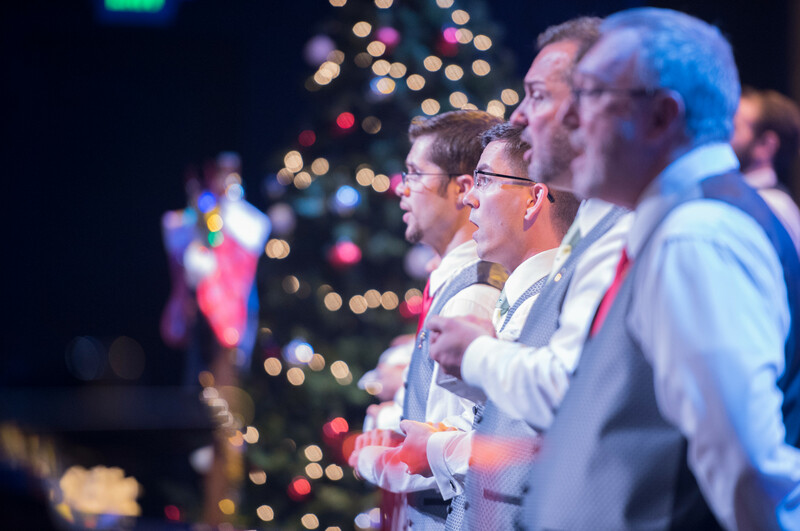 Steel City Men’s Chorus’ mission is to create community, educate, and give voice to LGBTQ issues through music and service. In addition to our performances, we participate in a number of local community outreach programs, supporting AIDS Alabama and Community Kitchens of Birmingham during our inaugural year. During the summer of 2013, a group of men gathered around the idea of creating a new all male choral ensemble. From meetings around dining room tables, Steel City Men’s Chorus was born. From our first rehearsal in August, 2013, until our first performance on December 6, 2013, some 35 men and their supporters worked in a whirlwind to create and incorporate a new non-profit and produce a show. Our sold out holiday show, Our First Noel, told us that we were on the right track. Steel City Men’s Chorus is a proud member of Chorus America and the Gay and Lesbian Association of Choruses (GALA). In October, 2013, a group of SCMC leaders attended the GALA Leadership Symposium in Atlanta, coming away with some wonderful ideas to enhance our organization as well as feedback affirming the solid foundation we have built. Membership in Steel City Men’s Chorus is open to anyone, 18 and older. Singing members must be male or identify as male and be able to sing a male vocal part (TTBB). Non-singing membership is open to both men and women who do not wish to sing but desire to support SCMC through active voting membership. All members must pay dues as required by the Board of Directors to remain in good standing. If you are interested in joining Steel City Men’s Chorus, please contact the Chorus Manager at david.reynolds@steelcitymenschorus.org. We produced three well-received main stage shows in Season Four, including a sold out holiday performance at Birmingham’s historic Lyric Theatre, our largest venue to date. Our spring show, “4 the Record” took us back to Virginia Samford Theatre for a tour of pop hits from the 1960s through today with a narrative of Birmingham’s gay history provided by the hilarious Dr. Larry Contri and John Laskow. Finally, our pride show, produced in partnership with Central Alabama Pride, took a very intimate look at the real life stories taken from our singers’ lives and ended with a hilarious set by comedienne Shawn Pelofsky. Behind the scenes, the board adopted its first three-year plan to map out the chorus’ future and began our first national search for an artistic director to take the reins from our founding music director, Stephen Morros. That search resulted in the very successful hire of Michael Weinberg, Director of Choirs at Randolph School in Huntsville, a former Musical Assistant of the 300-member Gay Men’s Chorus of Washington, D.C. and a candidate for his doctorate in choral conducting from Yale University. Financially, Steel City ended the 2016-2017 fiscal year with a cash position of $30,760, meeting our goal to establish restricted funds for future performance and outreach opportunities and a new scholarship program for university-aged students. This is a 500% increase over our previous season and reflective of a successful “Over the Rainbow” development campaign and a successful search for season underwriters. Mr. Jeffrey Klinner, a local realtor and philanthropist, returned for his third season as our Presenting Sponsor. He was joined by our first corporate underwriters, BBVA Compass Bank, which signed on as a Season Sponsor; and by Silvertron Restaurant, which sponsored all our catering needs. Overall, contributed revenue increased by 28% or $14,154 over the 2015-2016 fiscal year. It is worth noting that the chorus’ members, directors, and staff continued as in previous seasons to provide more than 50% of the organization’s contributed revenue. Together with our underwriters, we were able to fund Season Four’s three subscription concerts, a joint performance with the Gay Men’s Chorus of Washington, D.C., several community appearances (Baron’s baseball, Movies at Avondale Park, etc. ), and a new community service outreach program, providing volunteers to clean city parks and neighborhoods. In four short seasons, Steel City has proven its ability to produce quality entertainment that opens hearts and minds while also maintaining a fiscally sound business operation. We remain mission focused in everything we do as we enter Season Five, a Season for Growth. With a new artistic director in place to lead us, a growing membership, and a qualified Board of Directors providing sound financial and governance decisions, we believe we’re in a position for explosive growth in reach and influence. We are extremely grateful to all the partners, underwriters, advertisers and donors who help make our dream of providing social change through advocacy in the arts possible and real. Please join us! (1) The SCMC held three primary ticketed performances in fiscal years 2014/2015 and 2016/2017 and two in fiscal year 2015/2016. (2) In fiscal year 2015/2016 performance expense included additional cost related to participation in the GALA music festival. (3) In fiscal year 2016/2017 the SCMC held its first hosted fundraising event resulting in increased fundraising costs. (4) In fiscal year 2016/2017 the SCMC Board of Directors designated $8,214 for future music festival program participation.